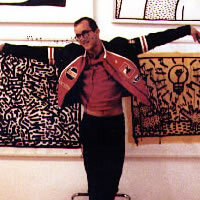 Welcome to the Keith Haring art database. We have developed this online archive in an effort to make the artwork of Keith Haring more widely available to researchers, educators, students and anyone interested in learning more about the work of Keith Haring. We hope you find this resource helpful. To navigate the database, simply select a year from the top menu. Click on the thumbnail image to see a full size picture and to learn more about an artwork. To search essays, press, bio use the search box in the right hand menu on most pages. Please note that the contents of this site are for personal and/or educational use only. The artwork of Keith Haring may not be reproduced in any form without express written permission of the Keith Haring Studio.